We are an AAU member school and participate in local, national and international tournaments. Our requirements for promotion to advance through the ranks are based on ability, attitude and dedication. Our basic monthly fees are $50 to $55 a month depending on the method and payment selected. We hope this information helps in your seach for a karate school. If you are interested in our school, please contact us. There are four basic systems in the martial arts. 1. Self Defense/professional use of force system and is not considered an art. 2. Traditional/discipline system where values and character building is taught. 3. Spiritual/health system and is designed to develop internal strength and harmony. 4. Sport/tournament focus. 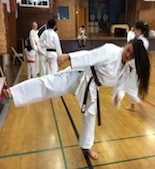 Training for tournaments and sport karate is demanding and challenging. American Karate Kai is a traditional Okinawan karate school that stresses the value of respect, loyalty and integrity. 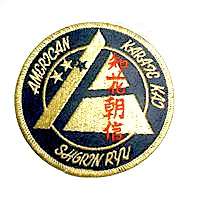 We are Shorin Ryu, Kobayashi style founded by Master Chosin Chibana. 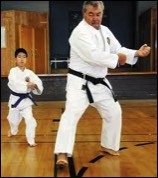 We also teach traditional karate weapons such as, staff (bo), short swords (sai), sickles (kama) and nunchaku's. We also teach grappling, throwing and mat work to enhance the overall ability of our Students. Self defense is also given special emphasis, with classes provided once a week for all who are interested, especially women.